Also, be sure to visit as many systems in a sector before you move on. The sectors only get harder and harder so it's better to get as much scrap as possible and only leave just before the fleet would get to the exit node. You should also have some sort of a plan with your weapons, e.g. use missiles to take out their shields and then use your burst laser to take down their weapons. It's pretty much always a good idea to take out their weapons first, especially if they have a bunch of missiles or enough lasers/beams to get through your shields. Also, you pretty much always get better scrap from not accepting surrenders and just blowing them up. Only accept surrender if they offer a ton of something you need at that moment (like fuel or missiles), they offer a nice item as well, or if your ship is heavily damaged and you don't want to take any more damage. Constantly having to repair your ship can be a huge drain on your resources. If you don't happen to find enough firepower to reliably take down an enemy's weapons before they get a volley or two off (especially of missiles), then invest in a defense drone or more engine power for the dodge. If you have the extra scrap, but you have a ton of weapons already, then getting cloak can be a good investment, too. Like Krakow said, there's lots of little things that add up over the course of a single playthrough. If your ship keeps exploding, ask yourself where things went wrong. Did your enemies just keep having too many shields? Next time, get more burst lasers/missiles/ion/bombs and not so many beams. Never finding any weapons? Explore on a wider path to find more shops, or maybe you should have taken a different option for that one event you failed. Not enough scrap? Pick more fights instead of skipping them (e.g. helping civilians being killed by pirates and so on). Also, don't focus on just winning. Just play your best, and have fun, because after you win once or twice the game loses a little bit of magic. You should move on to King of Dragon Pass. Good luck winning that one! Thanks for the tips you guys. Most I already discovered myself. I typically keep a minimum of 200 scrap before I start spending it. And even then only when I really need it. I typically keep a minimum of 200 scrap before I start spending it. And even then only when I really need it. That may be overdoing it a bit in the other direction. If you've got about 100 scrap or so, getting a shield upgrade usually helps out greatly in avoiding the first enemy volley. Then you can try saving up. At least, that's how I play. Everybody's got their own preferred playstyle, there's no one best way to play. Which is one of the game's strengths. Today my computer crashed and lost my save on my best run ever. I had the Adjudicator (Zoltan Ship) with maxed shields, maxed crew, a mantis teleporter strike force, the best beam weapon, best burst laser, almost maxed engines and Engi Nanobot infusion. I was pissed off man. Know the feeling. Played Spellunky ones and manage to get everything. Robbed the black market. Found the golden city. Had a ton of gold. Almost finished and then the game decided to crash. Lost everything. I was about half way through had a good run, got my self a good crew and dense layer of shields and plenty of scrap to upgrade my weapons once i found a new store. Then I got into a fight in a nebula system with a mantis ship, I took some hits but brought him down eventually kind of show casing i needed a new weapon to cut through heavy shielded ships. During the fight my O2 got hit so I sent some spare guys to go fix it as well as getting borded as well I vented those rooms to space. All in all I got roughed up and it was a hard fight then I notice that I'm out of O2, strange I fixed it when ti was hit. I check I have closed doors to space it should be filling back up again. Then I see it I was in an electrical storm part of the nebula and it knocked out my O2. Before I could redirect power everyone but my rock man dies. I rage quitted that run. 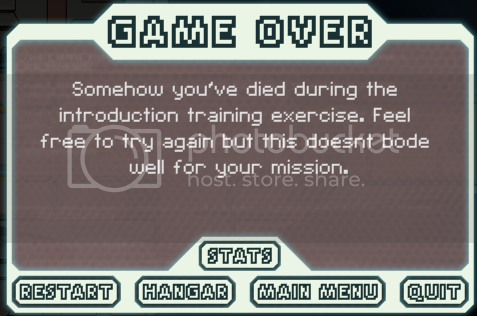 I have since beaten the game that rebel flag ship stood no chance against me. I know I am a bit behind everyone but today I beat the game on easy mode. Yay me! I was starting a new game after finishing and unlocking the Federation cruiser is it me or does the the ship look like a huge.. I guess I stole your luck Pat, because I just beat the flagship for the first time. And on Normal too (haven't touched easymodo). I did it using the slug ship (anti-bio beam is godly because you take almost all your enemies intact, giving you more goodies). I was so well prepared the flagship hardly scratched me. By the last phase it had one crewmember running around like a blue-arsed fly trying to keep all his failing systems operative. Luckily someone had warned me that killing all of the crew leads to the ship activating an AI and becoming tougher so I avoided that. I'm on level 5 with the starting ship and just unlocked a new one. Getting tired of seeing the same random events popping up over and over again. Im not I like it, trying to beat the final ship with a Zoltan ship got almost did it had a good run but just didnt have enough weapons to punch through 4 levels of shield I had the money just didnt find a store that was selling weapons that I needed. Thats my usual problem with the zoltan ship. Its great at surviving but past sector 2 its shield piercing is pathetic.